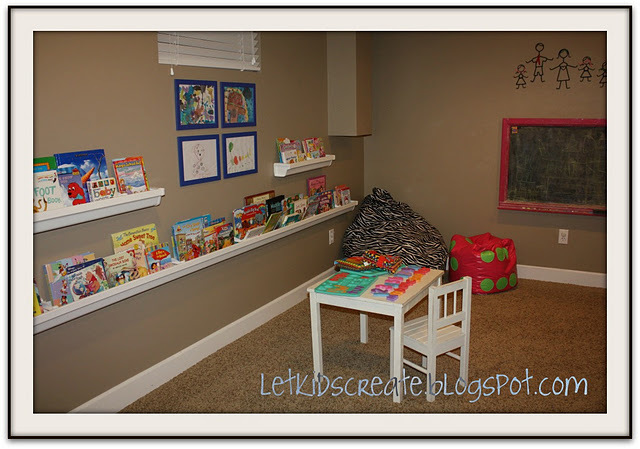 Who says books only have to live on shelves?? Here are some great alternatives to ordinary bookshelves that are also super kid friendly. Kids can see the fronts of the books instead of the spines. You can put the books within reach, or out of reach depending on your needs or desires. The books don't topple over on the shelf just because you pulled on book out. 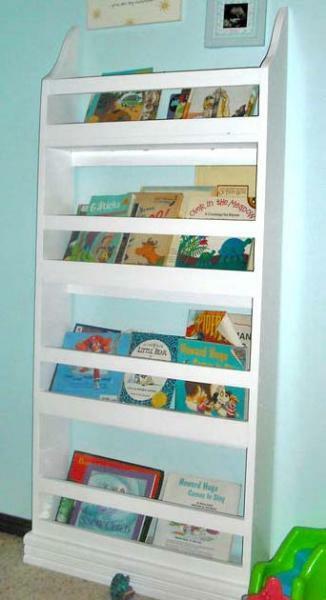 It serves as a display for rotating book selections, keeping things "fresh." This is pretty and "designer-ish." I suppose if I did this it would look like the gutters misplaced inside the house. However, Brooke from "Let Kids Create" did a fantastic job using these materials in a functional AND stylish way. I'm so impressed. Her blog is full of amazing and beautiful ideas. 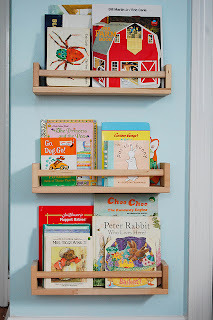 Over at Domestic Simplicity they used inexpensive IKEA spice racks for book storage. Again, another beautiful application that makes unique materials look super stylish. For style, options and super helpful instructions, you cannot do any better than the free colorful design plans from Ana White. 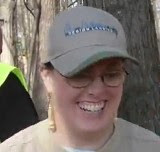 She has plans for every kind of cool thing you could imagine, including kids furniture and playscapes.